Major house price declines have eased in Ireland in 2012, thanks to the increasing demand from tech companies like Google, Linkedin and Facebook, which have set up offices and headquarters in the country. It was plain attraction to Dublin’s tax rates pegged at 12.5%, according to IDA Ireland and reports from Bloomberg Businessweek, compared to that in the UK at 24%, 33% in France and 35% in the U.S. The development agency IDA Ireland saw the economic benefits of these tech companies led by Google in 2011. Thus, the IDA Ireland came to the aid of other tech companies PayPal, Dropbox, SumUp, and even Yahoo.com to find properties and meet local regulators. The companies bring in some foreign workers because of the specific language requirements, but their direct and indirect benefits to the micro economies in Dublin from property and let-in businesses, markets and restaurants are definitely being felt. “These people are spending here. The knock-on ripple effect of them from housing, property, coffee, and lunch is massive for the greater area,” Ms Louise Phelan, Paypal’s vice president of global operations tells Bloomberg Businessweek in an interview. It still is a long way to go for Ireland’s economy to make a complete turnaround, since the European Union bailout in 2011. 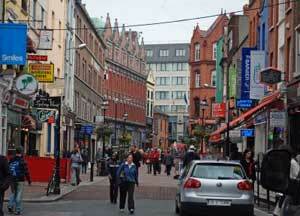 Nonetheless, goods and services exports rose 9.1% to €170.6 billion in 2012 compared to €156.3 billion reached in 2007. The Global Property Guide Research reports that in Dublin, Ireland’s capital, the residential property price index fell by 2.5% (-3.6% in real terms) in 2012. In the rest of Ireland(excluding Dublin), property prices dropped 6.1% (-7.3% in real terms) over the same period.